On a frosty winter’s day, a walk that features a waterfall can be an utter delight. Even if the waterfall itself hasn’t frozen over, the spray generated will be captured in some beautiful icicles on any surrounding trees. 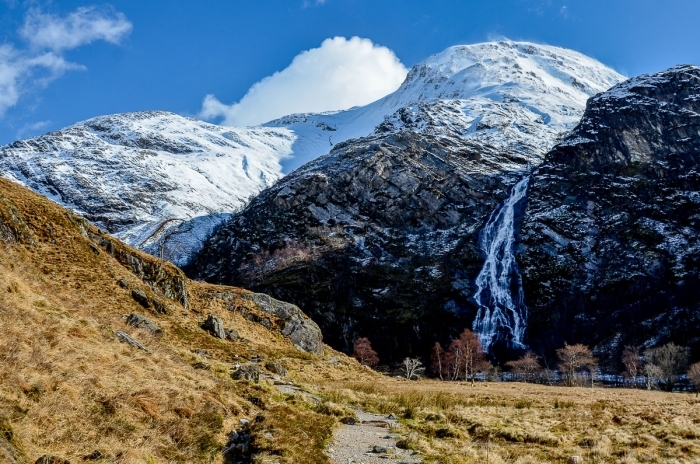 Here are some (prepare yourself for some extreme alteration…) wonderful winter waterfall walks to wander. Park at the Forestry Commission’s Chia-aig Car Park from where you can walk along the road to a lovely wee picnic spot next to the Chia-aig Waterfall and the Witches Pool. From here you can walk further along the road towards Loch Arkaig, take the next left, cross the bridge over the River Arkaig and immediately take the track to the right that follows the southern lochside. This will, eventually, with an overnight stop, lead towards Glenfinnan so the bothy at Invermallie makes a good point to stop and open your flask before heading back. This walk is just shy of six miles there and back, there are some smaller walks from the car park. Start at the Lower Falls Car Park which is next to where a 17th-century highland village was built for the Rob Roy film. From here you can walk down along the road to view the Lower Falls from the bridge that crosses the river. Head back towards the car park and you will see a path on your left that follows the river up the glen. After about 1.5 miles of fairly easy walking, there is a footbridge that takes you back over the river and you then can then walk back down the road to your car. At the end of the road up Glen Nevis, there is a car park which is the starting point for a walk alongside a tumultuous gorge. The path leads into a sheltered glade where a wire rope bridge leads over to the private An Steall Bothy and the base of Steall Waterfall. The path is rocky so make sure you have appropriate footwear and in the winter it can be icy in places so do please take care. The walk there and back is just short of 3.5 miles. The car park is often very busy, but there is sometimes space to park at the side of the road further down the glen – please take care not to block the road and please don’t park in passing places. Heading south from Fort William, just after the turnoff for Corran Ferry, you will come to the small village of Inchree. The Forestry Commission’s Inchree Falls Car Park is well sign-posted from the A82. From here there are three marked routes through the Glenrigh Forest which can be combined if you have the time. There are wonderful views of the falls themselves and over Loch Linnhe. You may also be lucky enough to see some red squirrels. They often visit the feeders near the car park, especially during the winter when food is in short supply, and there are holes in the screening so you can look through without disturbing them. There are two lovely spots to call in at, north of Glasgow, on your way to Fort William. The Meeting of the Three Waters in Glen Coe and the Falls of Falloch just north of Loch Lomond are great spots to take a break from your drive.